People who are confined to wheelchairs and are unable to safely transfer out of them by either standing or sliding transfers will need some sort of mechanical lift to enable their transfers. Mechanical patient lifts use different types of slings or strap systems to secure the patient in the lift, are either manual or battery powered and are classified as either floor lifts or ceiling lifts. If you have two slings (sling A and Sling B), and if you have two lifts (lift A and Lift B), you can't use sling A with Lift B or Sling B with lift A no matter how similar they seem to be. Never use a sling on a lift if it wasn't designed for that specific model of lift. 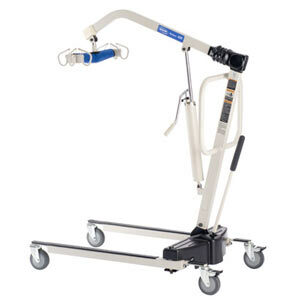 Manual patient lifts consist of a wheeled base, a vertical mast, a boom and a hydraulic ram. The wheeled base is normally in a "U" shape with 4" or 5"
The vertical mast of the patient lift connects the base of the lift to the boom. The mast is mounted in the middle of the closed end of the "U" and has a pair of handholds for the caregiver to use to move the lift. About two thirds of the way up the mast there will be a flange or bracket of some sort to anchor the bottom end of the hydraulic ram. The top of the mast provides an anchor point for the pivot end of the boom. The boom attaches and pivots at the mast. About a third of the way along the boom from the mast the upper end of the ram is attached creating a triangle out of the mast, boom and ram. At the opposite end of the boom from the mast, either a four point or two point cradle is attached to the boom which the sling carrying the patient is hooked up to. The cradle is centered over the open end of the "U". The hydraulic ram has a lever about two feet long which when pumped will extend the length of the ram and push the boom's cradle end higher in the air. There are two different ways to lower a hydraulic rams depending on the manufacturer. There may be a valve at the bottom of the ram to lower the ram when opened. If this valve is not closed the ram will not pump up and lift the boom. If the ram doesn't have a obvious valve at the bottom, the valve may be a button which is depressed when the pump handle is pressed against the side of the ram. If anything can go wrong with a manual patient lift it's the ram. Eventually the seals in the hydraulic ram will need to be replaced and this is indicated by the lift slowly lowering itself when it's supporting a patient's weight. A power patient lift is essentially the same as the manual version but instead of a hydraulic ram between the mast and the boom there is a mechanical ram which is powered by a rechargeable battery pack. The power lift has an electrical switch which will activate the ram. The pictured lift is an Invacare Reliant Plus 450 and has a weight capacity of 450 lbs. however there are electric power lifts available with 600 lb weight capacities.